1. Paragliding at Bir Billing in Himachal Pradesh. Bir Billing is located around 530 km. away from our national capital New Delhi. Bir Billing is considered as the 2nd best place for paragliding in the World and the best in India. Many foreign pilots travel to Bir Billing every year in the month of October and November. Due to the increasing popularity, Bir Billing hosted 1st Paragliding World cup of India in Oct 2015. In this paragliding world cup, pilots from 135 countries had participated. Going back in the history, Bruce Mills from New Zealand was among those to introduce Hangliding at Bir Billing in early 80’s but the trees at the Lower areas made the landing difficult. Later some French introduced Paragliding here and then many pilots started attracting towards Bir Billing. Then after, the govt. connected Bir Billing with motorable road, which boosted paragliding as a popular sport here. Bir and Billing are two different places located 16 km away from each other. Bir is located at 1350 mts. from sea level and it is the paragliding landing area, whereas Billing is situated at 2430 mts. from sea level and is the paragliding take off point. For doing paragliding, everyone has to drive to Billing for one hour in the hilly, mountainous road. Mr. Arvind Paul is amongst the top Paragliding pilots of India and flied at almost all the paragliding destinations in India. He helped us in listing the ranking of all the places. As regards to stay, the Best Place for staying at Bir Billing is Camp Oak View that is located in the Oak forest at 04 km. away from paragliding landing area. Camp Oak View has beautiful and cosy bell tents, a very industrious and knowledgeable team which is proficient in designing the tailor- made Trekking, Camping and Paragliding itineraries. The location itself of the camp is very beautiful. 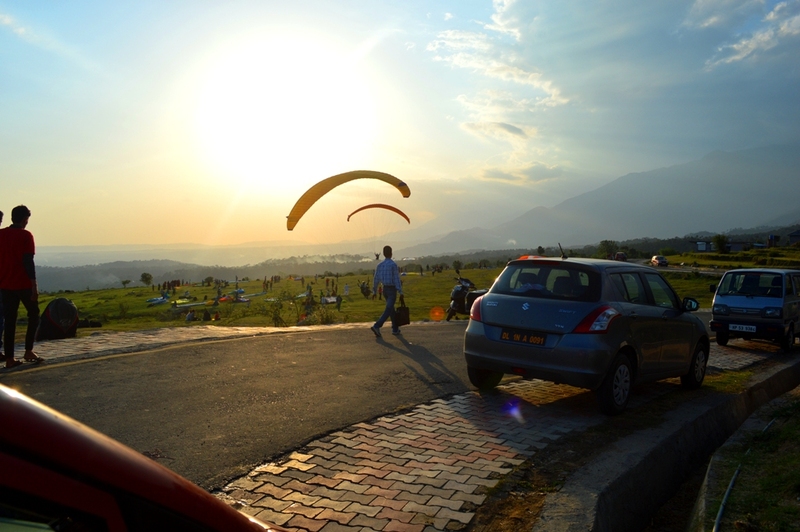 The normal Paragliding Flight at Bir Billing is around 15 to 30 min. Cost for the paragliding flight is INR 2500/- Per Person and additional INR 500 for HD video by GOPRO for paragliding flight. Travel to Bir Billing for Paragliding. Operational to travel:- Mid September to First week of July. Best Time to visit:- October to November and Mid Feb to Mid June. Other things to do:- Trekking to tribal villages, Camping in Oak forest. 2. Paragliding at Sikkim, India. Paragliding in Sikkim at Gangtok is quite popular adventure sport for the eastern part of India and why not, one can see magnificent Himalayan ranges and the snow covered mountain peaks and amazing landscapes of Gangtok. Here, there are two options for paragliding, one is short paragliding in which paragliding flight lasts for 10 to 15 mins. with maximum altitude of 1300 to 400 mts. over Gangtok city. The take off point for the short paragliding flight is Baliman Dara near Gangtok and landing point is at stadium field at Reshithang Sports Village. On the other side, the long paragliding flight is continued for 20 to 30 mins. which starts form the take off point at Bulbuley Dara in Ranka (near Gangtok) and landing point is at stadium field at Reshithang Sports Village. Travel to Gangtok for Paragliding. Paragliding price:- For short flight INR 2500 Per Person. Paragliding price:- For long flight INR 4500 Per Person. Duration:- 10 to 30 mins. Operational to travel:- October to May. Best Time to visit:- October to November and March to May. Other things to do:- Visit Sikkim, Waterfall nearby. 3. Paragliding at Almora, Ranikhet. Paragliding in Ranikhet is the most popular adventure sport in Uttrakhand.Ranikhet can be easily accessible from Delhi by overnight drive via bus/car. It is is located at the edge of green Oak forest. Here one can find various staying options from budget hotels, Camps to home stay’s. Paragliding at Ranikhet is quite safe with amazing views around and the flight here lasts for 15 mins in the air. One can learn paragliding here from a paragliding school. Travel to Ranikhet for Paragliding. Paragliding price:- INR 3500 Per Person. Duration:- 15 to 20 mins. Best Time to visit:- October and March. 4. Paragliding at Kamshet, Pune. Paragliding at Khemset is a place for paragliding that provides easy and safe location for paragliding learners. Kamshet is located in the dense Sahyadri mountain ranges.Kamshet lies between Mumbai and Pune, which is 98 km from Mumbai and 45 km. from Pune city. The town is located in the moderately high Sahyadri mountain ranges. The hills of this mountain range serve as the take-off points for paragliding in Kamshet. Positioned in Maharashtra, this is probably the only paragliding spot in western India. One can have the breathtaking beautiful Views of the Pavana Lake from the top during paragliding and age-old forts with many more interesting places.Travel to Kamshet for Paragliding. Paragliding price for normal flight is INR 2500 Per Person. Duration: 20 to 30 mins. Best Time to visit:- October to November and March. Other things to do:- Trekking in Sahyadri hills. 5. Paragliding at Nandi Hills in Bangalore. Paragliding in Nandi hills is one of the best spots in the southern part of India.Nandi hills are located at 60 km. drive away from Bangalore. It attracts many adventure lovers from the nearby region. Travel to Nandi Hills for Paragliding. The Paragliding activity at Nandi hills were initiated by the Karnataka State Tourism Development Corporation. But later due to objection of State Horticulture Department, it was closed as huge risk involved in the activity. Later it was again reopened for paragliding by the huge surge in the number of adventure sports enthusiasts. Here, one can have the paragliding flight from the height of above 1100 mts. above the sea level. Paragliding price for normal flight is INR 3000 Per Person. Duration:- 10 to 20 mins.